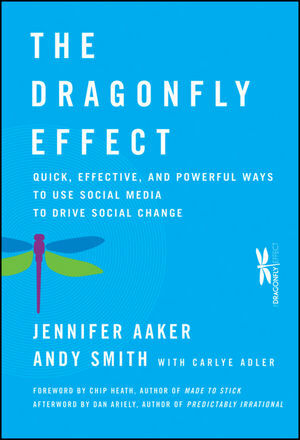 The Dragonfly Effect shows that you don't need money or power to inspire seismic change. A social psychologist and marketer, Jennifer Aaker is the General Atlantic Professor of Marketing at Stanford University's Graduate School of Business. Her research focuses on time, money, and happiness, and how small acts create significant change—fueled by social media. Her work has been featured in a variety of media including The New York Times, Wall Street Journal, Washington Post, BusinessWeek, Forbes, and NPR, as well as CBS MoneyWatch. Andy Smith is a principal of Vonavona Ventures, where he advises companies on marketing, customer strategy, and operations. Over the past 20 years, he has served as a high tech executive, leading teams at Dolby Labs, BIGWORDS, LiquidWit, Intel, Analysis Group, Polaroid, Integral Inc., and PriceWaterhouseCoopers. Foreword by Chip Heath, author of Made to Stick and Switch. Introduction: Why Reading This Book Is Worth the Investment. The Dragonfly Body The System That Keeps It Airborne. Wing 1: Focus: How to Hatch a Goal That Will Make an Impact. Wing 2: Grab Attention: How to Stick Out in an Overcrowded, Overmessaged, Noisy World. Wing 3: Engage: How to Make People Connect with Your Goal. Wing 4: Take Action: How to Empower Others, Enable Them—and Cultivate a Movement. Onward and Upward You’re Flying! Now What? Afterword by Dan Ariely, author of Predictably Irrational and The Upside of Irrationality.